Debbie K Being True to my heART: New Beginnings, back to my future. I hope to make some more progress towards my new future tomorrow. I begin an NHS admin computer training course which they have kindly sponsored me to go on. I am so grateful for the opportunity to learn new skills and just hope I do not let anyone down. Those new skills will make me more useful in being able to provide them voluntary support and may also help my chance of one day finding employment. If I can manage to take it all in, it should help boost my self belief and well being. For now I am just glad for the workplace experience again. One day I would perhaps like the opportunity to do a more caring people orientated role but for now I need to continue healing myself, who knows where my journey will take me. My previous career is not an option for me or something I could ever see myself going back to. My priorities have changed. I will be so pleased just to be well enough to try to get a job. To begin with that is going to be a big enough challenge. The last time I went on a course I was in a different place mentally. I was pre transition then and in a dark place, so stressed I suffered massive panic attacks and had to give up the course. I am both excited and a little nervous. My anxiety is causing the butterflies in my tummy to work overtime just now. Why is it, my brain cell can remember so vividly what happened a few years ago and remind me in the middle of the night, yet enable me to forget something that was said only five minutes ago? I still feel vulnerable but I am not afraid in the way I used to be. I am no longer afraid to be me. I feel ready and just want the chance to move on, to live my life authentically. I have a compassionate mind, I can be over sensitive but my heart has never felt better, I have never felt more comfortable in my own skin. I now know why my counsellor advised I should avoid having GRS and FFS in the same year. My body is still adjusting and so is my brain, to the physical and hormonal changes from my GRS nearly 6 months ago. There is still the odd twinge and alternatively also a lack of any sensation at all. Fatigue and slight post op blues are still a source of frustration but they are all recognised symptoms that should all, given time settle down. I need to get the work/family balance right and I really want to be up for the challenge and try to find some paid employment this year. Going back to education/work after being away so long feels like a new beginning. Tomorrow morning I have to be up earlier than I have done in many years to get to the course at the hospital. I hope to look my best and get there on time, so our doggy will only be getting a quick walk. I will certainly be seeing the world in a different light and have a renewed outlook on life. Hopefully I will not suffer a bad hair day and make a monkey of myself. The pictures not me before my make up, in case you are wondering! 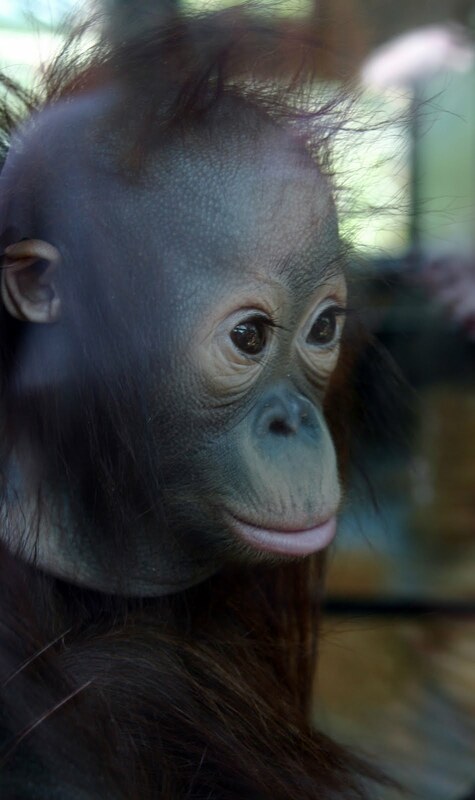 I could never look as beautiful as the young Orang-Utan from "Monkey World Primate Rehabilitation Centre" in the photo. If I manage to do well tomorrow it might just give me a better chance of a successful future and I might just remember to treat myself to that new top in the shop that keeps reminding me to buy one, every time I walk by. Good luck with the course, Debbie! A positive first step into your future life. I wouldn't mind doing something like that. You are probably on your way by now. I'm sure that you will enjoy the day. One of the best parts of courses, I think, is meeting the other people and exchanging ideas. Best of luck with it all, honey!! Remember... Bags of Swank, lass. I hope today has gone well and you have enjoyed the day. You've said this to me, but you are the one with a wonderful spirit. Good luck luv, I am sure once you get started it will all fall into place for you. Its lovely to see the optimism in you.